These candles can either be burned (follow our burning instructions if you want to preserve the beauty of our candles for years to come), or they can be pre-drilled at your request to accommodate an LED for convenience. Candles in this category are often enjoyed at specific times of the year. 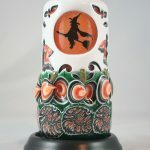 We have an assortment of Christmas type candles, but have also more recently designed Thanksgiving and Halloween candles. 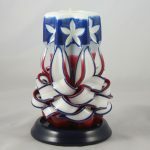 Our Patriot candles are also in this category because they are so appropriate for Memorial Day, Independence Day, Veteran’s Day or any All-American celebration! Our festive Christmas candles are in demand year-round. Their six designs include a candy cane, Christmas tree, angel, bell or bow, peace doves and a cross. Make Size and Pre-Drilled Well choices before viewing colors. 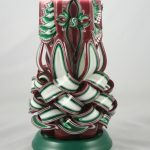 An alternative to our more elaborate Christmas Candle, the Candy Cane candle has the full basket weave bottom, only more of it! 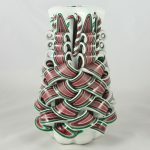 All topped by Candy Canes, a real treat! Make Size and Pre-Drilled Well choices before viewing colors. Our festive snowman candles are a seasonal favorite. 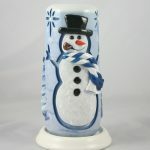 The design features a traditional snowman with top hat, pipe and winter scarf, together with a row of pine trees along the back. Make Size and Pre-Drilled Well choices before viewing colors. A design based on Old Glory, our Patriot Candle engenders a feeling of pride. The prominent star cutouts glow brilliantly when the candle is lit. Make Size and Pre-Drilled Well and Plaque choices before viewing colors. Gobble Gobble! 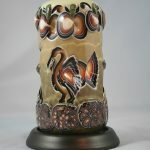 Our Thanksgiving candle boasts a fall theme of turkeys, pumpkins and corn stalks. We make it up in the fall colors of orange and brown. Click image to expand.